On Friday, February 1st – David Repa (FreeGeek coordinator) graciously played host to the CultureNet cohort as they checked out FreeGeek’s new digs down on Pandora Street and saw first hand just how amazingly the FreeGeek Vancouver organization has grown in little over a year! Congratulations to all involved. Mountains of Recyclables: Where To Turn? This coming Friday, David Repa (coordinator) from FreeGeek will be our first CultureNet seminar speaker. 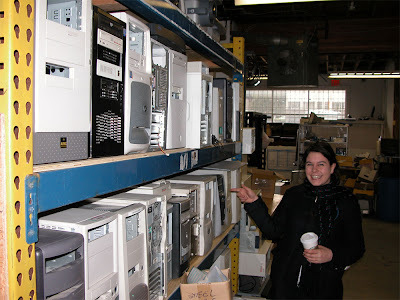 FreeGeek is a non-profit computer re-use and recycling centre in Vancouver with a strong educational mandate and commitment to supporting free/open source software initiatives. For more information go to FreeGeek or better yet simply attend Friday’s talk at 11:00am. David will be joining us at 11:00am in Cedar building, room 224 at the North Vancouver campus of Capilano College for an hour or so. All – students, staff, faculty alike – are welcome!